How does water travel through a plant? Your answer’s probably a simple one. Water moves from the soil, up through the roots and stems of a plant, through the leaves and out into the surrounding atmosphere. But recent research has shown that our traditional understanding of the movement of water through plants is incomplete. Under certain specialised conditions, some plants have evolved the ability to absorb water through their leaves, move it down the xylem, and them release it into the soil. The plants are actually watering their own roots – and their own seedlings. This off-beat mechanism for water uptake works well enough that these plants can continue to photosynthesise and grow, even when the soil they are growing in are dry. 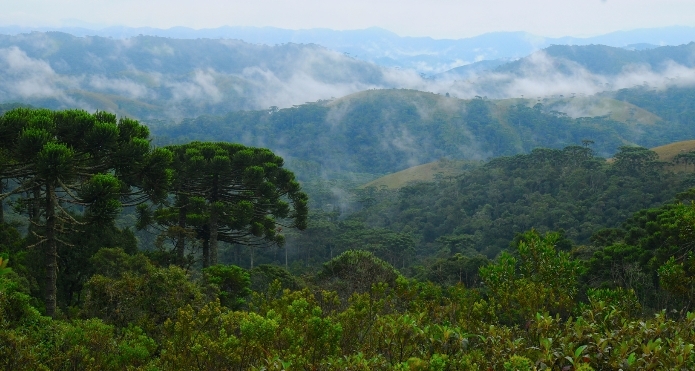 The trees the researchers studied – Drimys brasiliensis – grow in the cloud forests of Brazil, where the trees are almost constantly covered in fog. The atmosphere around the leaves has a higher water potential than the leaves themselves, allowing foliar water uptake. The exact pathway for water entry is still under discussion: this particular species has a hydrophilic cuticle that could facilitate water entry, as well as hydrophilic tissues within the leaf that could provide water storage. At least 70 species, across seven different ecosystems, have been identified as using this ‘back-to-front’ water transport mechanism, pulling water out of the sky and down to the rhizosphere. These new findings have important implications for our existing models of the climate and our ecosystems, which often consider soil water as the only source of water for plants. It’s another example of how plants are constantly over-turning our expectations. Read a blog post on this article in the Annals of Botany blog. Read a blog post on this article in the New Phytologist blog.